By Lewis Freedman, RD. Co-Author with Priscilla Timberlake of The Great Life Cookbook: Whole Food, Vegan, Gluten-Free Meals for Large Gatherings. My simple plan for dinner is; Start with a Grain, add a Bean, a Veggie that’s Orange and one that is Green. I have followed this simple system for years. To make an easy, yet complete, balanced and nurturing meal, I think of these 4 food groups. I generally start with looking in the refrigerator. What grains and/or beans do I have already cooked. If I have a cooked grain, I know I can freshen it up with steaming. If I have a bean, I can make a soup, or simply heat it up with some seasoning in a skillet. If not, there are many stored grains and beans I can start with. Then I look to an orange food. Winter squash, sweet potatoes, and carrots are most often at hand. Finally I complement with a green. Some might be in the refrigerator, some in the garden. Kale, collards, broccoli, snow peas, spinach and lettuce to name a few. Let’s break this down. The grain is the foundation. 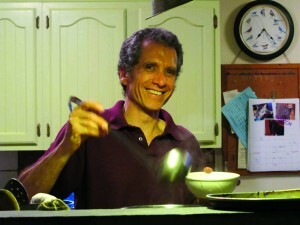 I use whole grains, and they are all easy to cook. There are many varieties of rice. We eat millet and kasha (buckwheat groats) regularly, each take about 30 minutes to cook. There is also corn, quinoa, wheat and oats. There is a huge variety of pastas to choose from to lay the foundation for our meal. Whole grains contribute fiber, B vitamins, vitamin E, and many trace minerals. What I am calling a bean is meant to include beans, legumes and other high protein foods. Green beans, soybeans, chickpeas, kidney beans, black beans, green peas, lentils, and peanuts are examples. In the meal, this contributes a concentrated source of protein, fiber, iron and many other minerals and nutrients. Now on to something orange. The orange foods add sweetness and earthiness. These foods are rich is phytonutrients which can be defined as bioactive plant-derived compounds associated with positive health effects (Merriam-Webster). These include antioxidants and vitamins. I am speaking of carotenoids, which gives the orange color, Vitamins A , C and E, and many related compounds which act as anti-oxidants, and perform other health promoting benefits. To complete the meal, I always add a green food. The green color indicates the presence of chlorophyll, which is essential to our health. This green color is indicative of it’s role in photosynthesis. It is through the process of photosynthesis that a plant absorbs and integrates sunlight into it’s structure. In this way, the plant acts as an intermediary for us, allowing us to indirectly absorb some of the life giving qualities of natural sunlight. Chlorophyll is packed with a range of beneficial nutrients. Greens are a great source of vitamins A, C, and K, rich in antioxidants and essential minerals including calcium, magnesium, iron, potassium, and essential fatty acids, which includes omega 3 fatty acids. Kasha (buckwheat groats), with a tahini miso sauce, baked tofu, steamed carrots and brocolli. I will add sea vegetables on a regular basis, as these contribute minerals and a strong alkalizing quality. This is the foundation, add other foods, season as you like, create and have fun. Now you have my formula for a simple and balanced meal. Start with a Grain, add a Bean, a Veggie that’s Orange and one that is Green.